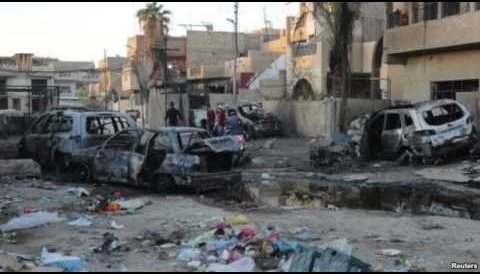 JNN 19 Feb 2014 Baghdad : Ten car bombs in central Iraq, including five in Baghdad, killed at least 49 people Tuesday, officials said, after another series of blasts the day before, according to AFP. The blasts in the Iraqi capital hit four different areas, killing at least 10 people and wounding at least 30. And three more car bombs exploded in Hilla, south of Baghdad, killing thirty-five people and wounding 22, while one in Mussayib and another in Iskandiriyah killed a total of four people and wounded 32. The attacks followed four car bombs in Baghdad on Monday that killed at least 16 people. Violence in Iraq has reached a level not seen since 2008, when it was emerging from a brutal period of killings that claimed tens of thousands of lives. Attacks and clashes have killed more than 480 people so far this month and over 1,450 since the start of the year, according to AFP figures based on security and medical sources. Meanwhile, Iraqi army troops backed by police forces have killed 15 al-Qaeda-affiliated militants, regaining the control of a northern town and nearby areas, an official said. According to Al-Alam, Iraqi forces backed by helicopters launched attacks on Sulaiman Bek from three sides, forcing al-Qaeda-affiliated militants who had overrun the Salaheddin province town to retreat, local official Talib al-Bayati told. Militants initially took part of the town and nearby areas on Thursday, only to be pushed back the following day. But security forces then withdrew for unknown reasons, Bayati said, and the militants were again in control of part of the town on Saturday and later made further gains. At least four civilians had been killed and eight wounded since Thursday. Sulaiman Bek has been hit by numerous attacks over the past year, and was briefly seized by al-Qaeda-affiliated militants in late April. Al-Qaeda militants, emboldened by the conflict in neighboring Syria, have sought to position themselves as the champions against the Iraqi government, though major Sunni tribes oppose the group’s extremist ideology and are fighting against it. Iraqi Prime Minister Nouri al-Maliki has called for national unity among Iraqis in the war against al-Qaeda. This entry was posted in Iraq News, Middle East and tagged Baghdad, car bombs, Iraq, Sulaiman Bek. Bookmark the permalink.